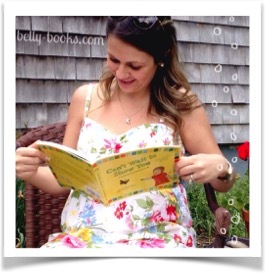 It's never too early to read to your baby! Even if your “bun is still in the oven” on Mother’s Day, you know very well that you’re already a mother, and you have lots to celebrate on this holiday dedicated to you. During this exciting time, don’t forget how important it is for you to relax and enjoy the moment. Relaxation not only feels wonderful to you, but is very good for your baby. As we all know, stress can have a strong impact on our physiological and psychological well-being, and recent research (this British study, for example) suggests that these effects can be passed on to the unborn baby. So take it easy, mother-to-be! Just by sitting or lying back comfortably and breathing, you’re accomplishing something important: nurturing and caring for your baby. As you take each deep breath in, you’re also breathing for your baby. She’s taking in that life-giving oxygen and it’s nourishing her and helping her grow. Each beat of your heart brings invigorating blood to your baby, making her stronger every moment. Meanwhile, those heartbeats and breaths are playing her a soothing, rhythmic lullaby. . . in full surround-sound! 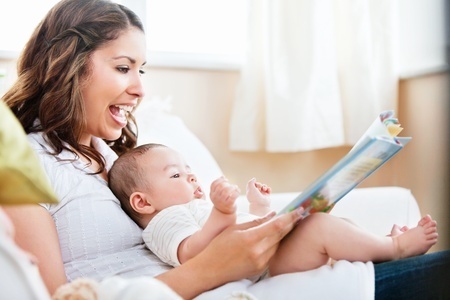 When you add your voice to the mix, especially by reading your baby a calming, rhythmic story, you have the formula for perfect relaxation for both mother and child. As you read aloud you’ll find yourself feeling more calm as your heartbeat and breathing slow down. This relaxation will immediately pass to your baby; you’ll both feel connected, soothed, and peaceful. Just like that, you’re forming a deep, loving bond. You may not yet know your baby, but your baby definitely knows you! She knows the rhythms of your body, your waking and sleeping cycles, when and what you eat, when you’re active or still, and most importantly, she knows your voice. Compelling research shows that the mother’s voice plays a crucial role in babies’ growth and development in the womb. Long before you hold your baby in your arms, you begin nurturing her through the power of your unique voice. Researchers at Harvard University Medical School reported their study in the Proceedings of the National Academy of Sciences, finding that an expectant mother’s voice plays a vital role in the development of the language centers in a baby’s brain. According to the study, a mother’s voice provides “the auditory fitness necessary to shape the brain for hearing and language development.” So, not only does talking to your bump help you to bond with your little one, but it actually helps her brain to grow! Babies in utero can recognize, and show a strong preference for, their mother’s voice over the voice of a stranger. See this study. Newborn babies remember and show attentiveness to nursery rhymes that were read to them by their mother during the last trimester of pregnancy. Check it out here. Babies in utero can distinguish between words spoken in their mother’s language and in other languages. Read this article. These and many related discoveries assure us that a baby in the last trimester is hearing, responding to, and remembering what she’s exposed to from inside the womb. Your baby is already familiar with the melody and cadence of your voice, and this interaction is stimulating the auditory cortex, which plays a large role in developing her brain. On top of that, research and lots of anecdotal evidence — including from our readers — strongly suggest that newborn babies are soothed and calmed by a rhythmic and repetitive story (or song) they heard regularly during the last trimester. When your baby is born she leaves the soothing environment of the womb, with its predictable, rhythmic sounds. But if you hold her close and read a poem or story you’ve practiced repeatedly, she will immediately be stilled by the familiar beat and by the beauty of your unique voice, the voice she has known and loved for months. Wouldn’t it give you a little extra confidence to have one more way of comforting your new baby when she gets fussy? So celebrate Mother’s Day by talking, singing, and reading to your baby even before birth. Soon enough, you will see your little one’s face light up when she hears you in person! Until then, you can know that she already knows and responds to the sweet sound of her mother’s voice. As an added bonus, you can be sure that by talking to your baby now, you are laying the foundation for future language and literacy skills, cognitive development and, best of all, a sweet, strong mother-and-child bond. The Belly Books collection is now brought to you by Cottage Door Press! Check out the all-new edition of Can’t Wait to Show You! And welcome Hey, Little Baby, a brand-new celebration for sisters- and brothers-to-be! Looking for the first edition?